Where will our oil come from? In 2005, the world consumption of oil averaged 82.4 million barrels per day. The world's population for that year (estimated on 1 July) was about 6.45 billion, meaning that in 2005, every person on the planet consumed an average of 4.67 barrels of oil. Not surprisingly, average annual consumptions vary greatly by region, from 27.5 barrels per person in North America to 1.1 barrels per person in Africa. Although the world per capita demand for oil peaked in 1978 at 5.36 barrels per person and fell to a low of 4.44 barrels per person by 1985 because of the various "oil shocks" that took place in the late 1970s, the demand has been rising steadily since 1993. As the world's population increases and more people aspire to the western, energy-intensive lifestyle, the world demand for oil will continue to grow. By 2030, it is estimated that the world's population will have reached 8.2 billion. If the average per capita oil consumption remains at 4.67 barrels per person, world consumption of oil will reach about 104 million barrels a day (about 20 million barrels a day more than it was in 2005). On the other hand, if consumption increases at the rate it has been over the past decade, it will reach 116 million barrels a day (32 million barrels a day more than in 2005). Producing an additional 20 to 32 million barrels of oil per day by 2030 will take considerably more than clever petroleum geologists and investors with deep pockets. First, in order to keep meeting world oil demand, it will be necessary to make new discoveries simply to replace the almost one trillion barrels of oil that will be consumed between now and 2030. Second, most of the places geologists would expect to find oil on the planet have already been explored, so it appears that any potential new discoveries would be in the oceans or in the polar regions. Third, many oil fields that were once overlooked because they contained heavy (as opposed to light) crude oil are now being accessed because the rising price of crude makes them economic to operate. The following graph shows the past 20 years of crude oil production in Canada -- it mirrors what is happening around the world. 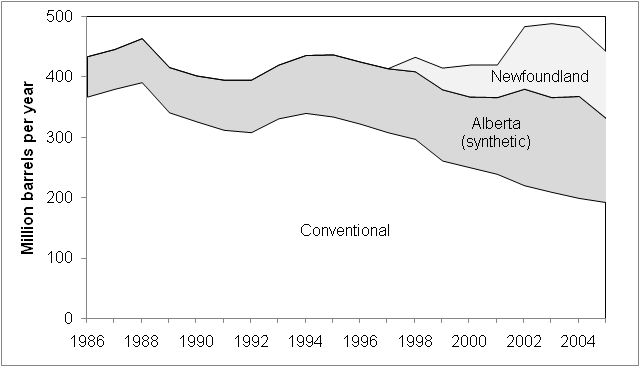 Between 1986 and the present, Canada's production of conventional crude oil declined steadily from about 370 million barrels a year to about 190 million. This decline has been offset by non-conventional sources, first by synthetic crude oil from Alberta's tar sands, and then by Newfoundland's Hibernia project. All fields are finite, and all will decline over time, some more slowly than others; Alberta's tar sands may appear limitless, but extraction needs water and energy, both of which may be in short supply in the near future. The global decline in the availability of light crude oil is reflected in the proposed refinery near Guysborough in Nova Scotia, which, if ever completed, is intended to handle heavy crudes. If the world supply of conventional crude oil is at or near its peak, and non-conventional oils are harder to find and require refinery upgrades, it is clear that other forms of liquid fuel will be needed to replace both what is being used now and to meet the growing demand. In its most recent Outlook for Energy, Exxon-Mobil expects that crude oil will meet about 90 percent of the world's demand of 115 million barrels a day of liquid fuels by 2030; the remainder will be met from natural gas liquids (or NGLs), oil from tar sands, coal-to-liquids, biofuels (notably ethanol) and so-called oil shale. Predictions are a tricky business at the best of times, and predicting the world's total accessible supply of crude oil is about as tricky as it gets. However, it is generally agreed that once about half the total volume of an oil field has been extracted, its output begins to fall; if this rule-of-thumb were applied to all fields in the world, one would expect that when half the world's oil had been extracted, world production would fall. According to Chevron, about one trillion barrels of oil have been consumed throughout human history until about 2005. Simple arithmetic shows that at present rates of consumption, by 2030, another trillion barrels will have been consumed. If, as many geologists are predicting, the world was endowed with between two and three trillion barrels of oil, this means that oil production will start to decline soon, if it has not already done so. A few people are suggesting that the world's total of oil was closer to four trillion barrels; if this is the case it means oil production will begin to decline sometime around 2030. Regardless of which camp is right, two things are becoming apparent: we do not have endless supplies of crude oil and there are limited alternatives to meet the growing demand for oil products. Relying on agricultural products for liquid fuels, such as ethanol, will lead to other problems as the world's population increases: whether to grow crops for food or for transportation.